When this card is Normal Summoned: Add 1 "Cyber" Spell/Trap Card from your Deck to your hand. If your opponent controls a monster and you control no monsters: You can banish this card from your Gravey.. When this card is Normal Summoned: You can make all "Cyber Dragons" you currently control become Level 5. You cannot Special Summon any monsters during the turn you activate this effect, except Machin.. If this card attacks an opponent's monster, it gains 300 ATK during the Damage Step only. Once per turn: You can reveal 1 Spell Card in your hand; this card's name as "Cyber Dragon" until the End Phas..
You can use 1 of these effects. :- When this card is targeted for an attack by an opponent's monster: You can banish this card; draw 1 card, then end the Battle Phase. :- You can target 1 face-up monst.. If this face-up card is targeted for an attack: You take no Battle Damage for the rest of this turn. When this card is destroyed by battle and sent to the Graveyard: You can Special Summon 1 "Cyber La.. While this card is in Attack Position, negate any Spell/Trap effects that target exactly 1 Machine-Type monster you control (and no other cards). When this card is destroyed by battle and sent to the .. Cannot be Normal Summoned/Set. 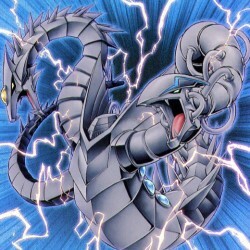 Must be Special Summoned (from your hand) by banishing all LIGHT Machine-Type monsters from your side of the field and your Graveyard, and cannot be Special Summoned by ..
Once per turn, you can either: Target 1 "Cyber Dragon" you control, or 1 Fusion Monster you control that lists "Cyber Dragon" as a Fusion Material Monster; equip this card to that target, OR: Unequip .. This card cannot be destroyed by battle with a Level 7 or lower monster. During each of your End Phases: This card gains 1000 ATK. If this card attacks, this increased ATK returns to 0, after damage c.. If you control no monsters, you can Special Summon this card (from your hand), but its original ATK and DEF become halved. During each of your Standby Phases: Increase the Level of this card by 1. The.. While this card is in Attack Position, face-up Machine-Type monsters you control with 1200 or less ATK cannot be destroyed by the effects of Trap Cards. When this face-up card is destroyed by battle a.. If this card destroys an opponent's monster by battle, select and activate 1 of these effects. :- Send 1 LIGHT Machine-Type monster with 1200 or less ATK from your Deck to your Graveyard. :- Special S..
Before damage calculation, if this card is being attacked by an opponent's monster, and was in face-up Attack Position at the start of the Damage Step: Inflict damage to your opponent equal to the att..
You can substitute this card for any 1 Fusion Material Monster, but the other Fusion Material Monster(s) must be correct. You can Tribute Fusion Material Monsters on the field, including this face-up .. If "Cyber Dragon" is in your Graveyard: You can activate 1 of these effects. If you have 3 or more "Cyber Dragons" in your Graveyard at activation, you can activate both effects and resolve in sequenc.. Discard 1 card; send, from either side of the field to the Graveyard, Fusion Material Monsters that are listed on a Fusion Monster Card, then Special Summon that monster from your Extra Deck. (This Sp..
Fusion Summon 1 Machine-Type Fusion Monster from your Extra Deck, using monsters from your hand or your side of the field as Fusion Materials, and it gains ATK equal to its original ATK. During the En.. While your Life Points are lower than your opponent's, the equipped monster's ATK becomes double its original ATK. While your Life Points are higher, the equipped monster's ATK becomes half its origin..